The Porcelain Tour is a small group unique and professional in-depth discovery of exquisite Chinese porcelain and ceramics at its origins. The Porcelain Tour is a small-group, unique and professional in-depth discovery of exquisite Chinese porcelain and ceramics at its origins. Celebrate the timeless beauty of ceramic arts and crafts at the most important porcelain centres in China, personally engage with the masters and participate in an interactive workshop experience. Are you impressed by the Chinese porcelain displayed at the British Museum? Would you like to visit the studios where those pieces were made and are still being made today to learn and interact with the masters? Would you like to learn about the contemporary porcelain and ceramics as well as the creative industry in China? Join us on this special tour and immerse yourself in a unique cultural experience in China. Unlike conventional trip-planners, we avoid the touristy attractions and will only take you to the most authentic places related to the theme of porcelain. Whether if you have been to China or not, the tour will show you a side of China that you have never seen. The Tour is organised by the well-established China Design Centre (CDC), based in London, has hosted numerous high-profile cultural and creative exhibitions showcasing famous Chinese specialists. It is the cultural bridge between East and West. This tour is exclusive and so the number is limited to 12 persons. If you are interested and would like to reserve a place, please contact info@chinadesigncentre.com. Caroline Cheng is the Executive Director of The Pottery Workshop in Hong Kong, Shanghai, Beijing, Jingdezhen and Dali. Cheng is an international well-known ceramic artist and curator. Cheng has brought together ceramicists not only from the region, but from all over the world. With her dedication and vision, she has become instrumental in nurturing of young artists, encouraging dialogues and cultural exchanges. Cheng received "Outstanding Achievement Award" from American National Council on Education for the Ceramic Arts (NCECA) in 2014. Cheng exhibits her works worldwide, some of which are collected by The British Museum, The Fitzwilliam (Cambridge), Asian Art Museum (San Francisco), National Museum (Beijing), Ceramic Museum (Vallauris) and Hong Kong Museum of Art. Wenying Li is the Programme Director of Sanbao Ceramic Art Institute in Jingdezhen. Her bother, the famous ceramic artist Jackson Li, founded the Institute in 1995. Wenying has more than 10 years’ experience in leading specialised ceramic tours in China. She will be our expert guide in Jingdezhen. Shanghai Museum is an inevitable stop, with an entire floor of galleries devoted to the history of ceramics. The rich collection here will give you a comprehensive understanding of Chinese art history. We will take you to the Pusu Art Space. There, enjoy some tea time with a talk about the cultural history of Chinese porcelain and tea. Their exquisite contemporary furniture collection is worth a visit as well. Visit M50 on Moganshan Road. Visit MoreLess showroom there and meet the founder/designer HOU Zheng-Guang. MoreLess seeks to create a culture and personality within a balance of function and beautiful form. In the evenings, enjoy the city night scene at the famous Bund and some of the best trendy food in China. Jingdezhen has been the centre of porcelain production for 1,700 years. It is a unique town, even the street lamps are made of ceramics. We will pay a visit to the China Ceramics Museum to gain a in-depth history lesson on the porcelain capital and the evolving techniques over the 1,000 years. The Pottery Workshop, established in 1985, is a multi-faceted cultural institution, thoughtfully designed to promote and support the education of Ceramic Arts through their communities. The Pottery Workshop’s many facets live in four major cities in China; Hong Kong, Shanghai, Jingdezhen, and Dali. Each Pottery Workshop offers a resource of making and learning to its community, under one umbrella, they present a united educational platform for the growth of international ceramic artists, researchers, and students. We will have the chance to meet the founder, Caroline Cheng, whose work has been collected by the British Museum. Based on the protection and utilisation of the porcelain industry heritage, Tao Xi Chuan Ceramic Art Avenue programme is a project which integrates industrial development and modern forms of urbanisation. Various Artist-in-Residence projects are currently taking place at Tao Xi Chuan, with international artists from more than 20 countries. The RedHouse ceramics studio was founded by Takeshi Yasuda, Felicity Aylieﬀ and Xiong Baixu, with the aim of creating an artistic communication between East and West culture. Takeshi Yasuda and Felicity Aylieﬀ are well-known pottery artists, and their works are collected by museums and galleries all over the world. As a professional curator, Xiong Baixu has been working in the ceramic art management industry for nearly 10 years, devoted to the development of contemporary ceramic art. Visit Ceramics Industrial Park (Mingfangyuan), where many renowned studios specialised in traditional ways of porcelain-making are located, including Kudan and Zhenshang. Kudan was once an unknown individual workshop in Jingdezhen’s eastern suburbs. Due to its unique style and the superior quality of their products, they have gained popularity among Japanese tea houses and museums. It is considered to be the best high-quality porcelain studio using traditional craft skills in Jingdezhen. Zhenshang Ceramics was established in 2000, and specialised in designing and making display porcelain for so many years. They insist on making porcelain by hand with different techniques, including blue and white painting, famille rose, glazing and carving. There you can see the craftsmen working on the decoration of giant vases, carving an exquisite piece that takes 3 months, and so on. Sanbao Ceramic Art Institute, also known as Sanbao International Ceramic Art Village, was initiated by potter Jackson Li in 1995. The concept of the first international ceramic art centre in China led to the search for a suitable site on the outskirts of Jingdezhen. For centuries, the Sanbao Valley has been the source of China stone for the studios of Jingdezhen and was dotted with numerous old water-powered hammer mills for crushing the stone. A group of old farm houses and an adobe houses were chosen as the site for the art centre. At Sanbao, you will be invited to participate in an interactive half-day workshop with local ceramic artists in a purpose-built studio, getting a hands-on experience of porcelain-making in Jingdezhen. Visit the beautiful ancient village with a rich history of porcelain-making near Jingdezhen, with relic sites of old ways of porcelain making, dun-making and dragon kilns. Visit the old town of Yaoli, ancient wharf and stores of Dongbu, where the porcelain started their journey to the West hundreds of years ago. Jian ware is a type of Chinese pottery originally made in Jianyang, Fujian province. It, and local imitations of it, is known in Japan as Tenmoku. The wares are simple shapes in stoneware, with a strong emphasis on subtle effects in the glazes. In the Song dynasty Jian ware achieved a high prestige, especially among Buddhist monks and in relation to tea-drinking. They were also highly valued in Japan, where many of the best examples were collected. Though the ceramic body is light-coloured, the wares normally are glazed in dark colours, with special effects such as the "hare's fur”, "oil-spot" and "partridge feather”, caused randomly as excess iron in the glaze is forced out during firing. We will visit Shuiji town in Jianyang, Fujian province, where the Jian ware originated. Explore the UNESCO World Heritage Site Wuyi Mountains (Wuyishan). 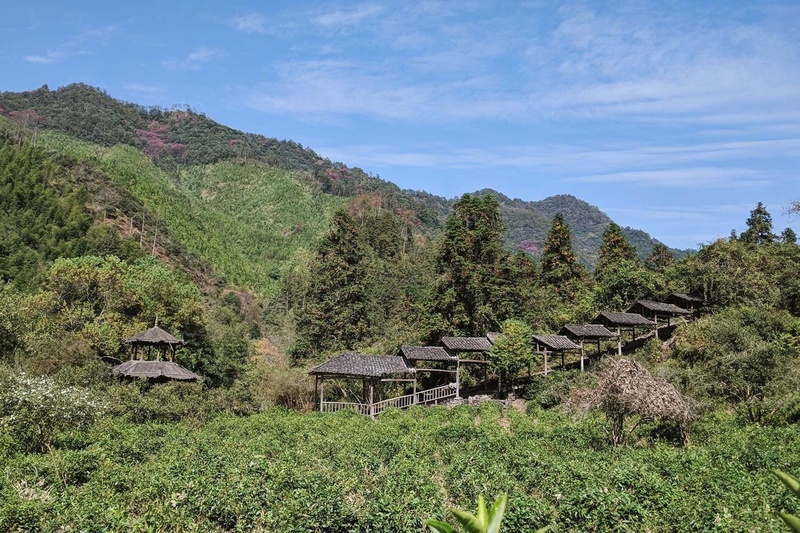 The Wuyi Mountains has rich tea culture, and it is the birthplace for one of the earliest and most famous black tea known around the world: Lapsang Souchong. We have the chance to visit the tea mountains and a tea factory to discover the secret behind the expensive rock tea from Wuyi region, as well as having a tea tasting ceremony. Celadon is a pottery term denoting both wares glazed in the jade green celadon colour, also known as greenware, and a type of transparent glaze, often with small cracks. Celadon originated in Longquan which is renowned for these highly admired glaze. Visit Longquan Celadon Ware Museum, a new and important part of the Longquan Celadon Creative Park project which includes the Museum, Masters’ Residence and the International Ceramic Village. Visit the celadon master CHEN Aimin in his private showroom. Chen started to learn the craftsmanship of celadon from his father when he was 18 years old, and has devoted to the innovation of this ancient art since then. In his showroom, we got the chance to see his journey of designing and making over the past decades, with masterpieces showcasing a range of eye-opening techniques of celadon. Visit a historic Longquan celadon dragon kiln that is still in use today in Baoxi Village. Also in Baoxi, we can visit the innovative and sustainable bamboo architecture project initiated by Qiantao Ge. Visit the Folk Art Museum at the China Academy of Arts. The Folk Art Museum stands in a former tea plantation on the China Academy of Art campus in Hangzhou. To help embed the 5,000-square-metre building in the sloping terrain, Kengo Kuma's architectural design studio fragmented the museum into separate units that gradually step up towards the forested summit of the hill. Visit Southern Song Dynasty Guan Kiln Museum and China National Tea Museum. Enjoy a tea (and food) ceremony at the private Qing Teng Teahouse besides the famous West Lake. Internal domestic bullet train tickets, first class seats. Private Tour Guides - English speaking cultural specialists throughout the tour. All transfers by private mini-bus / taxi and driver when applicable. 13 nights’ accommodation in standard rooms throughout, four and five-star hotels. Meals: Breakfast, lunch and dinner throughout (except Day 1 where lunch/dinner is paid for locally). Entry to museums, studios and private group tours as specified on the programme. International flights and relevant taxes. Chinese tourist visa, which is required for most foreign passport holders. Travel, health and trip cancellation insurance. Meals apart from those included in the itinerary and alcohol. Discretionary gratuities for guides and chauffeurs. If you have any enquiries, please email us at info@chinadesigncentre.com.